Rory McIlroy finished the Players Championship on a high as a closing 66 left him in a tie for sixth place, four shots behind winner Martin Kaymer. McIlroy recovered from an opening bogey at Sawgrass to move to the turn in 35 after birdies at the sixth and eighth. He hit eight birdies in total with two runs of three successive birdies, including his final three holes. 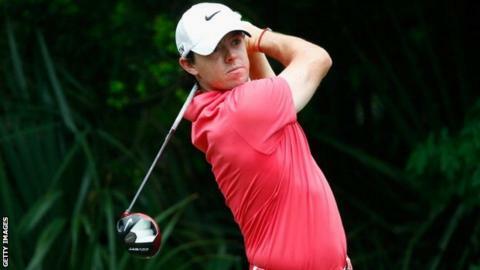 McIlroy returned to the world's top ten on Monday after moving up one place from eleventh to tenth in the rankings. As Martin Kaymer, the leader and eventual winner of the Players Championship was about to start his final nine holes on Sunday, McIlroy was five off the pace on nine under par and sharing sixth place. However, McIlroy will surely have been happy with his weekend's work after needing to hole a putt on the final green on Friday to make the cut. The Northern Irishman, 25, had gone to the turn in a disastrous 42 shots on Friday and it was only on Sunday that the world number 11 finally began to get to grips with the opening nine holes. For the second successive day, McIlroy finished his round with three straight birdies which only served to emphasise the gulf in standards between his front and back nines in the tournament. Overall, he took 152 shots for the opening nine throughout the week but was 25 shots fewer on the inward half. Graeme McDowell endured a more subdued conclusion to the event as he managed one birdie and a bogey in his 72.